Without any added sugars at all, this is one of the best sweet potato dishes I have ever tasted. I’ve made a pecan crusted brown sugar sweet potato dish for the past few Thanksgivings. That one is always popular, but this one is actually even better. My husband absolutely loved this and has already stated that he would happily eat this for a dessert. The sweet potatoes are roasted until they are bursting with rich flavor. The color is intense and the flavor is almost indescribable. The vanilla provides a delicious undertone to the dish and the butter and cream take this to a level I can only compare with a warm mousse. I served this on Thanksgiving and every single person who tasted it loved it. Two recipe requests and my husband’s rave reviews to everyone who would listen, proved that it wasn’t my imagination. This is an incredible sweet potato dish. We are all looking forward to having it again. For a girl who didn’t think she liked sweet potatoes very much, I am now a solid convert. I’ve made sweet potatoes in three more recipes over the past week and I LOVE them. Preheat the oven to 350 degrees. Place the potatoes on a baking sheet and bake until fork tender, about 1 hour. Remove from the oven and let cool for about 5 minutes, or until cool enough to handle with care. Peel and discard the skin. I cut mine in half and the skin basically fell right off of them with barely any effort. Place the potatoes in the bowl of a food processor*. While the potatoes are cooling from the oven, pour the cream into a small saucepan over medium heat. Add the scrapings from the vanilla bean, as well as the vanilla bean pod itself. Bring to a simmer and heat for 5 minutes, scraping the sides and stirring occasionally. Remove from heat. Use tongs to remove the vanilla bean or simply pour through a strainer onto the potatoes in the food processor. Add the softened butter. Puree the mixture until completely smooth and thickened. Season with salt and pepper. Keep covered and warm until serving. Enjoy! The original directions are for a food processor, however I do not have one right now. I made this using a hand potato masher and the blender, pureeing the potatoes in two separate batches. It worked great, but it definitely would have been simpler with the food processor. I made these the day before. I cooled them completely and them covered them and placed them in the refrigerator. A couple hours before serving them, I set them on the counter to come closer to room temperature. Then, I warmed them in the oven at 350 degrees for about half an hour. Stir before serving. 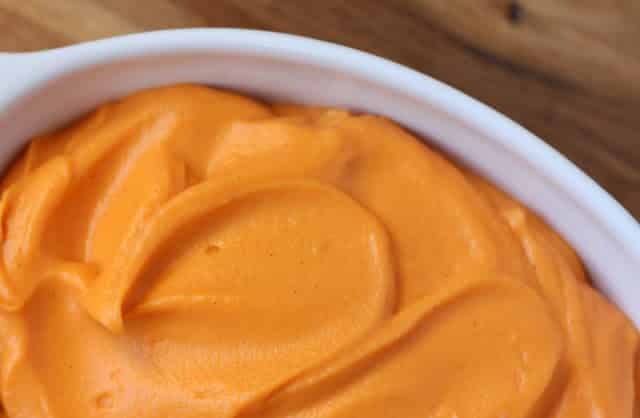 Oh yeah, I'll definitely be making this for Alexis, she LOVES sweet potatoes and I have two beans that need to be used. those have got to be the absolutely the smoothest potatoes I have ever seen in my life!! Unelievable, girl! And to think you did that with a hand masher and blender?!! You totally ROCK!! I so want these. NOW! 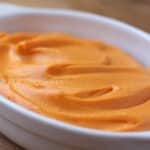 I can never get my sweet potatoes so smooth....it makes me want soup though....pass the cream! 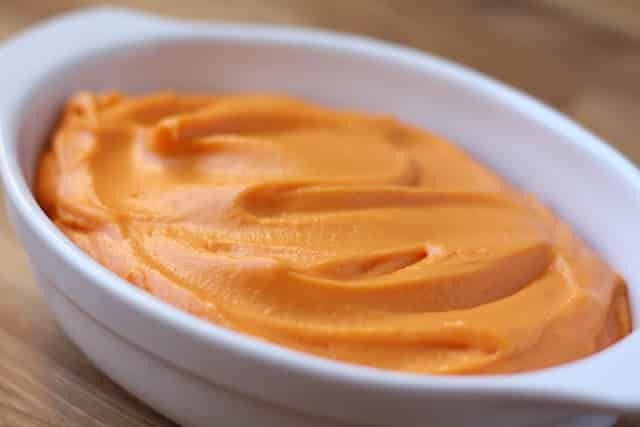 Absolutely beautiful mashed sweet potatoes! I tried this and it was a big hit... :) Thanks for sharing! I'm so glad that you enjoyed it, Anisha! Sounds like a plan! Do you think this would work if the sweet potatoes were steamed? That might cut about 45 minutes out of the cooking time. I think that the basic recipe would work, but the taste would probably be different from the original. Roasting sweet potatoes brings out a great deal of sweet flavor that I'm not sure would come through with steaming. If you do try it, please let me know how they turn out. I would love a shortcut version of this recipe! Truly yummy. I made this last week to test before the big day. OH MY so good. Can you tell me what a serving size is and how many this revpe makes? Trying to calculate if it would work on my diet, thank you! Hi Dawn, this serves 8. Hope that helps! Hi! You mention cream in your recipe but I do not see it in the ingredient list. How much? Thanks! Thanks so much for checking on that! I'm not sure how, but the ingredient list was missing half the ingredients. I've corrected it to the proper amounts now. Enjoy!